Have you heard about Kim Yeo-sa? In the previous post I mentioned about biased views about ajummas (e.g. The Third Gender) I mentioned how ajummas are treated generally in Korea. Kim Yeo-sa is another representative example to show how people have prejudice against ajummas especially for ajumma drivers. Kim Yeo-sa illustrates how ajumma drivers are satirically applied to Korean society. The most ajumma drivers were known and called collectively as Kim Yeo-sa. Kim is the most common surname in Korea and Yeo-sa means Madame in English so Kim Yeo-sa means Mrs. Kim. Various new media reports that Mrs. Kim caused car accidents due to her unskilled driving. However, one thing needs to be considered that there is dispute about the word Mrs. Kim. It is a (sexual) prejudice against female drivers as unskilled and inexperienced compared with male drivers. For example, there is not such a word, Mr. Kim for unskilled and inexperienced male drivers. Moreover, Mrs. Kim is only for middle-aged and married women, ajummas. (The word Mrs. Kim is not used for single and younger female drivers) And even other non ajumma female drivers call ajumma drivers as Mrs. Kim. I’ve been driving for more than 15 years but I still feel scared and expect insults when I drive. I think they (men and non-ajummas) look down ajummas only because we are ajummas. They just ignored us because we are ajummas. And people don’t care whether we are well experienced drivers or not. Ajumma drivers were treated just as Mrs. Kim who are unskilled drivers whether these ajumma drivers are really good at driving or not. People just don’t care about their skills, rather they put ajumma drivers together and dismiss them as Mrs. Kim. They accepted themselves as Mrs. Kim and they are now trying to improve their driving skills (if they’re unskilled or inexperienced drivers). Of course some of Mrs. Kim and also Mr. Kim are nuisances on the road. However, we have to remember that all of ajumma drivers should not be considered as Mrs. Kim. 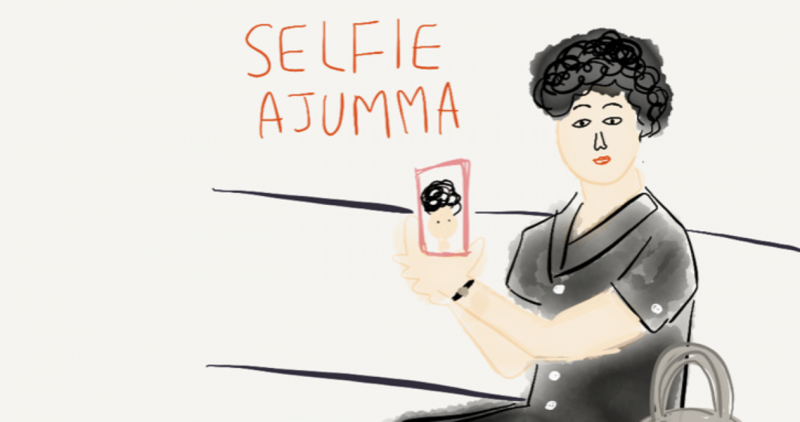 Many of ajummas drivers are very good at driving and many of non ajumma drivers are not good at driving as well. Thus, we should have fair-minded about ajumma drivers. Posted on 29 Dec 2015 29 Dec 2015 by moon ajummaPosted in Smart Ajumma (English)Tagged ajumma, ajumma drivers, 김여사, 아줌마, 아줌마 화이팅, 아줌마 운전, 한국, Kim yeo sa, Korean ajumma, Korean women, Mrs.Kim.